Why the Bayonet Plug is better than the connector you presently use. The Bayonet Plug is a totally new approach to speaker cable connection where every aspect of electron flow has been considered. The result is a connector that offers better sound quality for speaker cables in all price ranges from low-end to high-end. Most banana plugs use the conductive element as the locking system. By doing so, conductive performance of the connector is often neglected in favour of the mechanical means of connection. A split-pin design where the conductor pin is sliced into 2 or 4 elements thereby creating a frictional springing action to lock within the binding post. A barrel spring where separate leaf contact portions are arranged in a cylindrical fashion around the conductive pin, compressing on entry and frictionally holding the pin within the binding post. A single compression type spring (often a stainless steel wire) that forces a hollow pin against the inside of the binding post. A hollow thin-wall tube pin, split down one long side, that makes frictional contact via the inherent springing nature of the metal material used i.e. Beryllium Copper. All the above designs provide a secure connection, but sound quality can be compromised in a number of key areas. 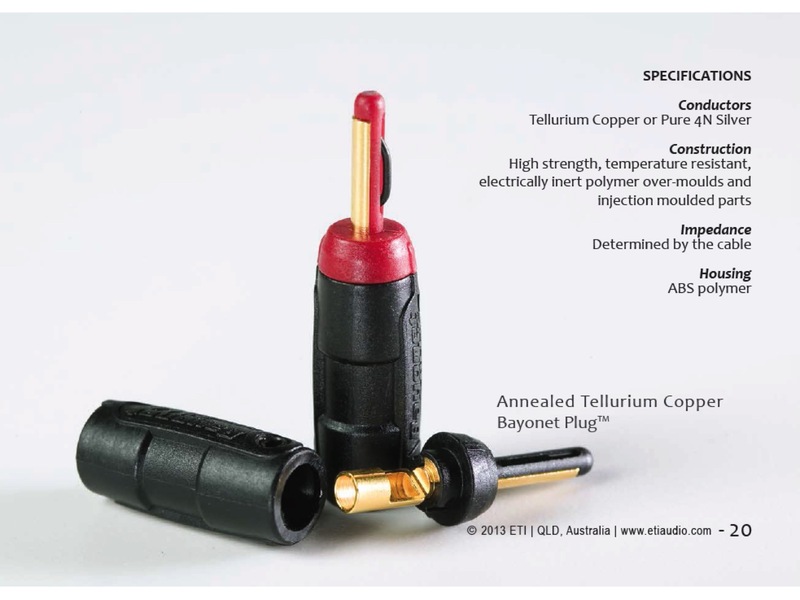 Most of the above banana plugs are made from gold plated Brass or Beryllium Copper with a conductivity rating of 28% IACS (International Annealed Copper Standard). As a comparison, the high purity copper used in most speaker cables has a conductivity rating of at least 100% IACS. The large cross-section of many Brass banana plugs can also cause phase errors and smearing due to skin effect - where high frequency signals travelling on the surface of the conductor are conveyed faster than low frequency signals travelling at varying depths and speeds within the metal itself. The result is often a slow, bass heavy sound. In contrast, the hollow thin-wall tube connector (Beryllium Copper) of the Eichmann Bayonet Banana Plug is compromised through a lack of mass, where the wall thickness doesn't support the large current flow from amplifier to speaker. The result is often a lightweight, bright sound. And finally, the split pin plug and the barrel spring plug can induce eddy current distortion where the signal is conveyed through multiple contact points. The Bayonet Plug connector solves the problems of existing banana plugs and provides a faster, cleaner signal of high purity and detail. To achieve this Eichmann uses a conductive pin of ideal thickness and mass - with minimal skin effect problems, and whose locking means is via a non-conductive frictional pressure insert (patent pending) rather than via the conductive pin itself. The conductive pin is machined from high-purity Tellurium Copper (over 90% IACS), or pure solid silver to ensure maximum conductivity. This provides up to 320% greater conductivity than gold plated brass plugs. A pure silver Bayonet Plug is also available. The Bayonet Plug is not only the best sounding banana plug available, but it also outperforms many spade connectors, and in some cases bare wire connection. Note: Most spade connectors are produced from low-conductive brass, and are often poorly shaped for the best transfer of electrons. Bare wire connection (to binding posts) doesn't always provide the ideal surface area contact, and the bare wire is also prone to oxidation. The Eichmann Bayonet Plug is designed with one thing in mind to provide the best sounding and best mechanical connection for ALL speaker cables. The Bayonet Plug - the closest approach to no plug at all.